By Cathal Kearney | April 30, 2013. Waterford native John O’Shea continues to be an integral member of the Republic of Ireland defence, while he has had a solid yet unspectacular season at the back for a dodgy Sunderland side. A goal and nine clean sheets to date signal a fine personal season for O’Shea, who has brought much needed leadership qualities and experience to the Black Cats since his move from Manchester United. Paolo di Canio was recently appointed to steer the club away from the relegation zone and so far, he has overseen an upturn in fortunes for the side. 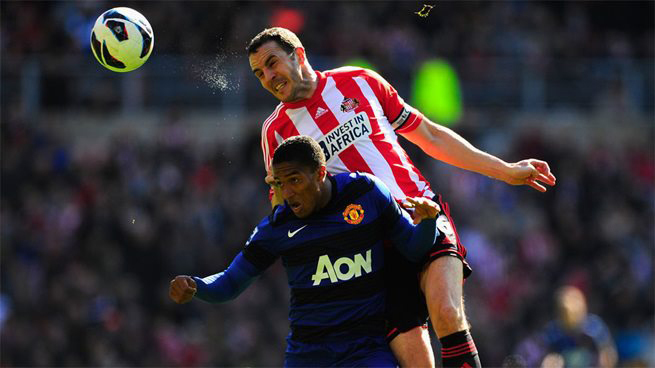 Top four hopefuls travelled to the Stadium of Light to face O’Shea and co. in yet another crunch game, with O’ Shea making his 30th league appearance of the season. Midfield dynamo Stephane Sessegnon scored the winning goal for Sunderland to earn them a crucial 1-0 victory, but it was the defence which impressed the most for the Black Cats. O’Shea, Danny Rose, Carlos Cuellar and makeshift right-back Sebastian Larsson put in stellar performances in front of the impressive Simon Mignolet in goal to nullify the potent Everton attack. Marouane Fellaini and Nikica Jelavic both looked the Toffees most attacking threats but it was credit to O’Shea and his defence who dealt with the Everton vanguard very well. O’Shea marshalled the defence well, while making some strong headed clearances from the box to help his side to a positive result. Next up, O’Shea’s team face fellow strugglers Aston Villa away in what will be yet another crunch match in the fight against relegation. On the international front, O’Shea can look forward to a summer of friendlies, as well as a game against Spain in the tour of the USA, before facing into some crucial World Cup qualifiers with the Boys in Green.